This will be an extended Weekend Movie Marathon... as I think I will need to start it today with how I am planning it. This weekend I will be concentrating on some classic (and not so classic) Black & White films. I will mostly be concentrating on movies I never seen before. Though I may throw in a few I have seen as well. Will see depending on my mood. 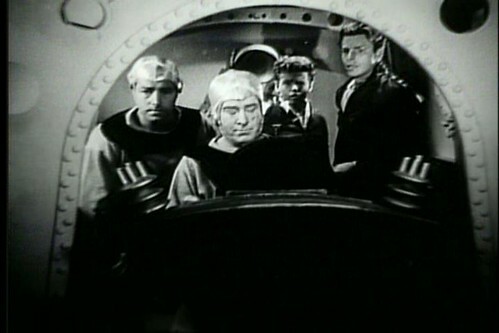 Preserved in a state of suspended animation for 500 years, Buck Rogers and young Buddy Wade are brought back to life by future Earth Scientists. They awaken in the year 2500 A.D. and planet Earth is in a state of emergency being ruled by Killer Kane and his super gangsters. 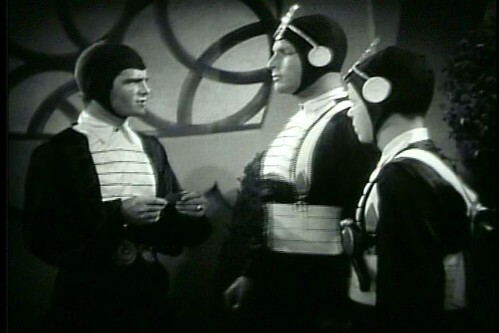 Earth is in dire need of rescuing and Buck and Buddy solicit the help of the planet Saturn to rid the Universe of this sinister tyrant. Thus, the spectacular intergalactic battles begin. Will the universe be saved from his sinister tyrant? Buck Rogers is a 12 chapter serial... meaning I am planning on watching 13 movies for this marathon. With one of the 12 chapters in between each of the movies. That is a nice chunk of watching there... hopefully I will be able to get it all done between today and Sunday. That is what I will be attempting at least. Below is a short list of some of the films I may be trying to include. Though I am not ruling any from my collection out. These at least sound interesting to me right now. Above is just a small selection of what I may be working on between now and the weekend. Every one of those listed above (except for one title from The Mummy Legacy Collection) are movies I never seen before. I may not watch all of what is listed above. It all depends on what I am in the mood to watch when it is time to watch one. Sorry Roger... Don't have Stagecoach. Guess it is one I will have to look into. While participating in a contest at a local newspaper in which school children are asked to submit a news story, local attorney Carson Drew's daughter Nancy intercepts a real story assignment. She "covers" the inquest of the death of a woman who was poisoned. Nancy doesn't think the young woman accused of the crime is guilty and corrals her neighbor Ted into searching for a vital piece of evidence, and they stumble onto the identity of the real killer. I got this movie as part of a classic movie boxset... Shirley Temple and Friends... which a good friend gave to me not too long ago. I have been a fan of Nancy Drew since the TV Series in the '70s starring Pamela Sue Martin as Nancy Drew. 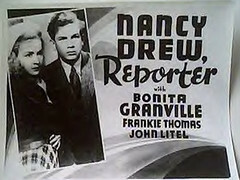 This is the first time I ever watched any of the old Bonita Granville movies. And I found that I really liked her in the role. I will have to look into getting more of these titles. The storyline is pretty good. And I got a kick out of the characters Killer Parkins and Mary. Who were two little kids (pre-teens) making Nancy's job harder. They were there for comedic relief. This boxset came from Mills Creek Entertainment... which from experience had been really hit and miss quality wise. While the quality wasn't what I would call great... it was more then watchable. But there was no extras what so ever of course. A nice start to the serial. It was more then enough to draw me in. Matter of fact I found I was getting into it so much that I almost forgot to take screen caps while watching. Only ended up with a few to choose from for the above picture. Sure... a lot of the effects are laughable... especially by today's standards. But I bet they though they were great back in 1939 when this serial was made. 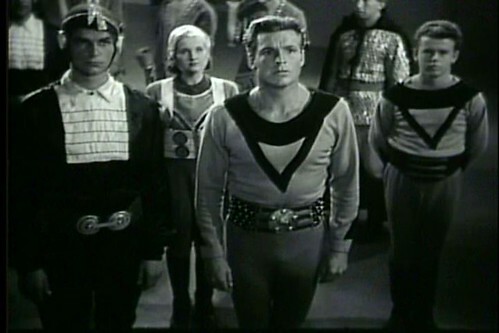 I really enjoyed Buster Crabbe in this. I have found I usually do. Which made me look him up in my DVD Profiler. Reminding me I just got a whole bunch of Billy the Kid movies starring him I can watch this weekend as well. I also enjoyed the kid... buddy (played by Jackie Moran). A film noir classic featuring Edmond O'Brien as the doomed victem, who having been mysteriously poisoned, must retrace all his steps from the last twenty-four hours to find his killers - before time runs out! Told in flashback style, the suspense is palpable throughout and builds to a rousing climax, even though O'Brien's fate is essentially sealed from the outset. This is a very good movie. I liked the storyline a lot. The entire cast was good. One thing did bother me a bit though. It was in the beginning of the movie. Multiple times within the first 15 minutes of the movie whenever he looked at another pretty girl you would hear the sound effect of a slide whistle. That took away from the movie for me. Thankfully it was only in the first 15 minutes of the movie. I just felt it wasn't needed... especially for the kind of story that this one is. I mean it would have been different if this was some sort of slapstick comedy or something. Just didn't work for this type of movie. But over-all this is one movie I would definitely recommend. In this chapter Buck, Buddy and Wilma make it to Saturn to try to form an alliance. Naturally things didn't go as well as expected. It is another good chapter. And I really liked the cliffhanger at the end of this one. Looking forward to Chapter 3. While I have seen this movie before. It is the first time watching this DVD Release. The Universal Legacy Collections never failed to impress me before. And this time is no different. I was amazed at how great this almost 80 year old movie looked. As for the movie itself... This movie isn't bad... but in my opinion it just don't live up to some of the other classic horror monsters like Dracula, Frankenstein & The Wolf Man. I do enjoy it enough that I am glad it is in my collection... and will watch it on other occasions... just not as often as the other three mentioned. This release also has a nice collection of extras... though I only watched the trailer for this viewing. This chapter is probably my favorite so far. I enjoyed the story. 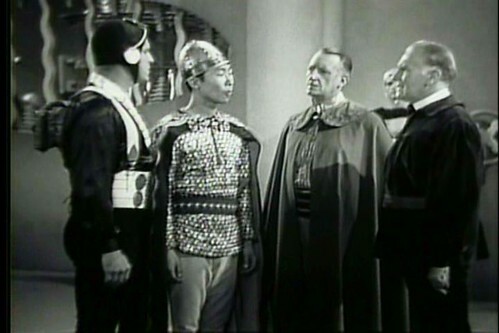 It has Buck Rogers going in undercover... and of course Buddy had to scam his way to go with him. This one also has the best cliffhanger so far as well. Really looking forward to seeing where they go from here. This one I never seen before. I may get some flack for this... but I actually enjoyed this one more then the original. I have found I still enjoy the other Universal monsters more then I do the Mummy. But I still enjoying these movies as well. This time the Mummy is played by Tom Tyler who I have in a couple of my favorite movie serials.... The Adventures of Captain Marvel and The Phantom. While this is still a good chapter... it feels a bit like filler. It goes further on advancing the storyline with a little less action. though it still has some action in it as well. In this chapter Buck, Buddy and Talon (guy from Saturn) try to escape and make it back to the hidden city. Billy the Kid and his pal Fuzzy discover a criminal Is attempting to prevent the completion of a stagecoach road being built by a female stage line operator. This movie is from a Billy the Kid 20 movie boxset that was given to me. It was released by Mill Creek Entertainment. So right from the start I was expecting the quality to really be hit and miss. In the case of this movie. It is watchable... but it doesn't look very good at all. there was a lot of dust and scratches in the film. And it was as if the brightness was turned up too far. So much in fact that in some scenes the faces and such almost blended in with the boulders and such in the background. There was also a slightly jumpy scene or two here and there. As for the movie itself... not bad. But I definitely seen better. I got a kick out of the character Fuzzy... who was obviously there for a little comedic relief. 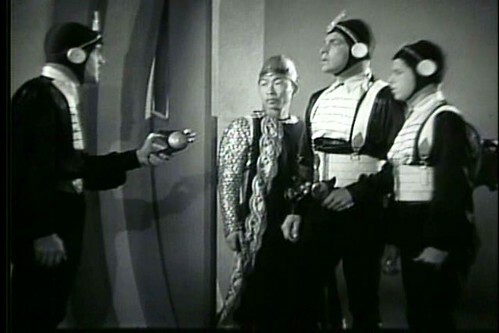 Early on in the movie he helped Billy to escape by using a sling shot to make a sheriff drop his gun. I may be remembering wrong... but I thought Billy the Kid was always an outlaw? In this movie (possibly this entire boxset as they seem to be somewhat related to each other) Billy the Kid is a wanted man... but he is innocent. And he is working to clear his name. Helping people as he does. Almost sounds like a TV series idea to me. Another pretty good chapter. In this one no sooner they make it home they head back to Saturn. This time without Buddy as he was injured on the way home the last time. This is another chapter that is heavier on the story then it is on the action. But still doing a fine job at keeping my interest. Billy the Kid and his partner Fuzzy are helping their friend Dave Crockett drive his cattle to market so Dave can pay off his bank note, when some ne'er-do-wells set sights on his ranch. This movie I enjoyed a little more then the last Billy the Kid movie I watched from this set. I just found this movie to be a bit more entertaining. There is still a lot of problems with the quality of the video... though this one wasn't quite as bad as the last on that either. The character of Fuzzy is once again fun to watch in this one. Though he does seem to be nothing more then a copy of Gabby Hayes. At least that is who he reminded me of.